A weapon, as defined by Wikipedia, is a tool or instrument used with the aim of causing damage or harm (either physical or psychological) to living beings… By definition, firearms and electronic alarm systems are both weapons. A firearm is a tool used with the aim of causing Physical damage or harm. An alarm system is a tool used with the aim of causing Psychological damage or harm. Both require regular testing, practice, and maintenance for reliable, effective operation. Just as responsible gun owners practice with (test) and maintain their defensive firearms on a regular basis; the same is required of alarm systems. 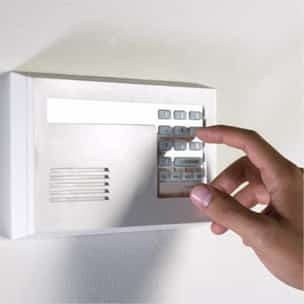 Alarm systems should be fully tested at least once a month which cost nothing but a few minutes of your time. Testing weekly is even better. Both provide defensive advantages. Both have defensive limitations. When used independently, each can be instrumental to a successful defense. But when used in combination, the probability of a successful defense is significantly enhanced. A firearm is portable and, with a competent human operator, can effectively protect life and property. However, a firearm must be operated manually and without a human operator, a firearm can do nothing to protect life or property or even itself. An alarm system is not portable but it can function automatically and can protect property, including firearms, without a human operator present. However, alarm systems must rely on the psychological impact of sirens, strobes, and its ability to call for help to cause the perpetrator to break off the attack. With rare exceptions, alarm systems can do nothing to physically stop a perpetrator. The FBI estimates more than 40 million firearms are stored loaded and unsecured in America. Guns, cash, and jewelry are the most sought after items by burglars and sneak (covert) thieves. These thefts are the primary source for guns used in violent crime in the USA. An alarm system, programmed and equipped to meet your specific requirements can go a long way in keeping your guns out of the hands of the wrong people. Only two things can stop a criminal or crazy from continuing a wrongful act: 1. That individual decides to stop (Psychological), or 2. That individual is subjected to an overwhelming force (Physical). A solid, reliable alarm system can significantly enhance the defense of property when you are away and exercising your concealed or open carry rights. When you are at home, an alarm system may stop the wrongful act before you are required to face or use lethal force which makes everyone happier – except the lawyers. Always remember, quality electronic alarm systems and quality firearms have three primary things in common; they both are reliable, neither is cheap, and one-size-does-not-fit-all. All gun owners should seriously consider a solid, reliable alarm system as an extremely important asset in their defensive weapons inventory. Wayne is a life long security electronics professional; inventor of The Pistol Pad and member of the TCHLA, TSRA, and NRA. His company, VIP Security has been serving Central Texas since 1983.